Paul Armstrong from Brett Garamella on Vimeo. There aren't many famous people that really inspire me nowadays. Derrick Rose is the exception. Why he said he could be the youngest MVP in NBA history, the media and experts dismissed him... then he led the Bulls to the best record in the NBA and won the MVP award. It felt like I hadn't left. Two of my local friends, warned me about walking around alone in Ciudad Bolivar, Bogota's poorest region. I had heard this before when I lived in Bogota so I took it as a sign of friendship. I went alone anyway. "You are very stubborn," said my friend Andres. "You're right," I said. "I am." I walked along the dirt roads and paths past stray dogs, fighting roosters, and grazing cows. Though this was Bogota's most populated region, it was removed from the city and I felt relaxed among the animals, green hills, and easy-going locals. After a good climb I arrived at Santo Domingo, a bustling neighborhood with spectacular views of the entire Bogota valley. On the main blacktop, boys were playing soccer. Behind two corrugated tin houses, two children laughed while using a wooden plank and a rock as a see-saw. 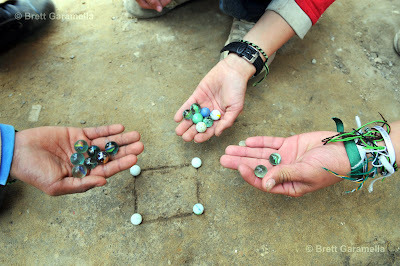 I then passed several boys playing a game on the dirt ground with marbles. I asked them what they were playing. "Chico," said one of the boys with a smile. I asked him more about the game, and the other boys gathered around to elaborate upon it. Then they invited me to play. 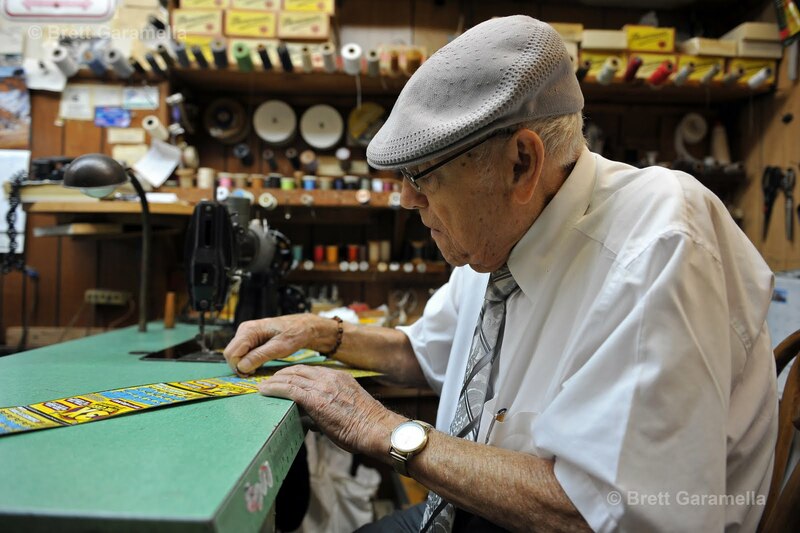 Chicho, or Cuadrito, is played with marbles, or piquis. Four marbles are placed on the corners of a square drawn in the dirt. All the players start at one spot and then go wherever their marble rests after they flick it. Each player has one marble and tries to knock the marbles resting on the square. Once all the marbles are knocked out, the object is to knock the other players' marbles. I was happy when I knocked just one marble. The boys hit about fifty percent of their target marbles. It was amazing to see. I hate losing so I asked them if we could play a different game – asking about the four holes they had carved in the dirt. They smiled and explained a game called Marrana. It was like playing marble golf with an all-out war at the end. Each of the four players had to get their marble in each hole in the proper order – hole 1, hole 2, hole 3, and hole 4. At any time you could knock your opponents marble. Once you passed the four holes, you could "kill" your opponents by knocking their marble, and thus eliminating them from the game. The player who never got killed, won. This game was easier for me. It was a fun and harmless way to be violent as the boys yelled, "Muerte!" when it was time to knock out an opponent's marble. We all laughed as two of the boys' mother watched from her doorstep with a grin. I am tutoring a few high school students in Manhattan and Queens, and one of these students is Tibetan. 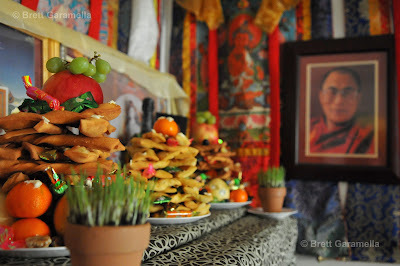 Today is the New Year in Tibet, so I took a photo of the food and decorations at my student's home.